A writer’s selection of storyline material as it relates to the tidy, well-maintained, Northern Ontario Jr. Hockey League. Boss Man. Now in his eighth season as commissioner of the NOJHL, 56-year old Rob Mazzuca is somewhat of a polarizing figure. Quite frankly, there is no middle ground with Mazzuca — you either like him or you don’t. You are either with him or you are against him. To be sure, the NOJHL has grown from seven teams to 12 under Mazzuca’s watch. And it has maintained its 12-member status since 2015. It says a lot about Mazzuca, his leadership and the manner in which he manages the league that team governors continue to retain him as commissioner year after year. Basically, what you see is what you get with Mazzuca. He is firm and fearless and while he may be a micro manager, he fiercely promotes and defends the league that he represents. Ask around about Mazzuca in other junior hockey circles and someone such as Kevin Abrams, the influential commissioner of the Central Canada Hockey League, will relay that the NOJHL boss is well respected. Meanwhile, there is little doubt that as the hands-on commissioner of the NOJHL, Mazzuca will continue to be a part of various storylines — some good, some not as good — that pertain to the league. Busy Beavers. A downtrodden franchise just a few years back, Blind River Beavers will try to make it three straight winning seasons in 2018-2019 with a solid executive in place and Kyle Brick at the helm as coach and general manager. As much as Brick has overseen the vast improvement in Blind River’s on-ice product, his trusted assistant Craig MacDonald has played a major role in the Beavers upward move as an NOJHL contender. Despite holding down a full-time job in Sault Ste. Marie that he commutes to and from his home in Thessalon, which is 50 miles east of the Soo, MacDonald also ventures another 40 miles east to Blind River to aid the Beavers in a big way as assistant coach, assistant general manager and director of player personnel. This is a guy, MacDonald, who truly does what he does for the love of the game. There aren’t too many in the junior hockey world with the work ethic that MacDonald shows away from his full-time job. American Eagles. Fans in the small Michigan town have supported the Soo Eagles with an average per game attendance of more than 600 for many years now. This, in spite of the fact that the Michigan Soo is also home to the Division 1, Lake Superior State Lakers of the Western Collegiate Hockey Association. The Eagles play out of venerable Pullar Stadium, which was built in 1939 and is approaching its 80th birthday. Not only do the Eagles get to play in front of good crowds in what is a classic, vintage facility that is very well maintained, the local NOJHL team operates the concession stand that features the famous Pullar Burgers. The team also operates the Eagles Nest within the Pullar, serving cold beer via Marchetti Distributing. Canadian Eagles. 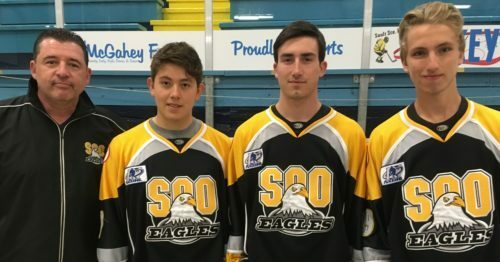 A true Twin Soo team, the Eagles will this season feature three rookie forwards from the Ontario side of the St. Mary’s River. Caleb Wood, Raf Praysner and Owen Shier opted to sign with the Michigan-based Eagles during the off season after playing leading roles with the Soo Major Midget Greyhounds (now called the Soo Major Midget Thunderbirds) of the Great North Midget Hockey League. Led by Wood, an Ontario Hockey League draft pick of the Soo Greyhounds in 2017, the trio combined for 35 goals in 36 games for the Soo major midgets in 2017-2018. Also new to the Eagles and a Canadian by birth is head coach Doug Laprade. Laprade, though, has lived in the Michigan Soo for more than 30 years and was a national championship player and assistant coach with the aforementioned Lake Superior State Lakers. Express Route. After missing the playoffs in each of the past two seasons, Espanola Express has gone a different route and brought in NOJHL championship coach (from his days with the erstwhile Sudbury Jr. Wolves) Dave Clancy as its new bench boss. Clancy and Espanola general manager Chad Clarke went out and signed a number of reputable players over the summer as they look to reward the many fans of the Express with a winning season in 2018-2019. Among the newcomers to the Express is young goalie Joel Rainville, formerly of the North Bay Trappers of the Great North Midget Hockey League. Rainville attended the OHL rookie camp of the Hamilton Bulldogs earlier this summer. Northeast Nook. They are in a league of their own, tucked away a few hours apart from one another and who could well form their own four-team division. Intense rivals on the ice and in their respective hockey communities, Timmins Rock, Kirkland Lake Gold Miners and Hearst Lumberjacks will all be out to try to unseat the reigning NOJHL champion Cochrane Crunch in 2018-2019. Cochrane does have an advantage over the others though as the Crunch will play host to next spring’s Dudley Hewitt Cup, Central Canada championship tournament. And, as host entry, the Crunch gets an automatic berth into the event, which besides a second NOJHL team, will also feature the champions of the Ontario Jr. Hockey League and Superior International Jr. Hockey League. In particular, Timmins and Hearst are supported very well at the gate and were 1-2 on the NOJHL attendance chart in 2017-2018. All four — Timmins, Kirkland Lake, Hearst and Cochrane — can be called hockey heritage towns. Rapids Flowing. After missing the playoffs in each of their first three seasons as members of the NOJHL, the French River Rapids are looking to advance in the East Division standings in 2018-2019. Now in his second full season as Rapids team president, Paul Frustaglio has provided better operation in French River and has gone out and hired former OHL defenseman Shawn Frappier as the new head coach. Player wise, French River will again be young as it aspires to develop a number of OHL draft picks, including forwards Hunter Brazier and Ryan Smith. Both players were taken at this year’s OHL priority selections draft, Brazier by the Oshawa Generals and Smith by the Sudbury Wolves. What are the expectations in Elliottt Lake?